Teachers in New Westminster delivered a special valentine to their school board when they announced an “illegal” strike February 14, 1921. Since the founding of the BC Teachers’ Federation in 1917, only one other local, Victoria, had defied their employer. The New Westminster walk out almost a century ago marked an important step toward full bargaining rights for BC teachers. 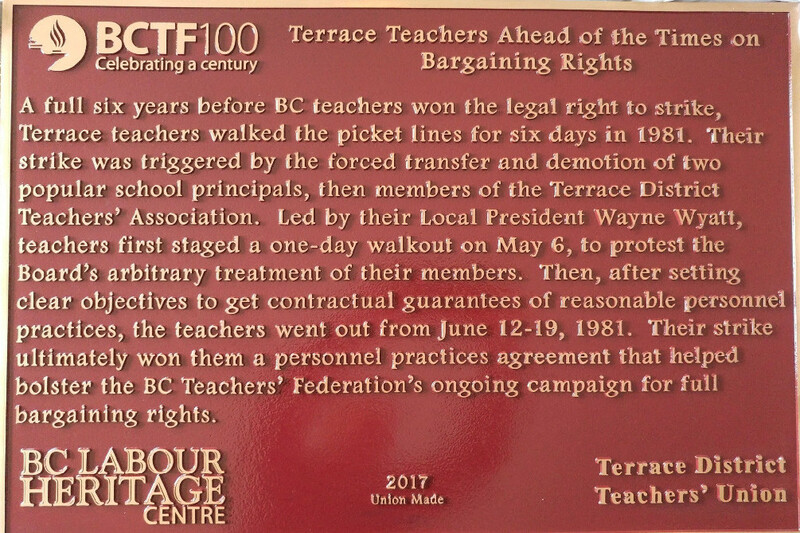 The plaque remembering this strike was unveiled today (October 30, 2017) at New Westminster Secondary School and will be permanently installed at another location soon. If any teacher needs a reminder of how far we have come as empowered educators with hard-won professional autonomy, consider reading the school board minutes in decades past. A glimpse of the meticulously typed New Westminster records of the early 1920s reveal glaring prejudices in an era when elected school board trustees held power over individual teachers. Miss Whelan protested and a petition requesting the board re-consider the decision was initiated by a teacher colleague, Mrs. Fulbrook. Miss Whelan sent a letter to the board defending herself as well, stating she had a doctor’s note explaining her work absences. Several of the trustees in this period had prominent positions in the community—and two (Trapp and Howay) had local schools named after them. Board chair Thomas Trapp owned a hardware store and had served on the board for 30 years. Robert Gray, board secretary, was a former mayor and Frederic Howay was a judge well-known throughout the province. Howay was biased against trade unions, having meted out stiff prison terms to several striking coal miners during the 1912-14 Vancouver Island dispute. It is instructive to note Howay resigned as trustee on February 19, 1921 following a contract agreement favouring the striking teachers. 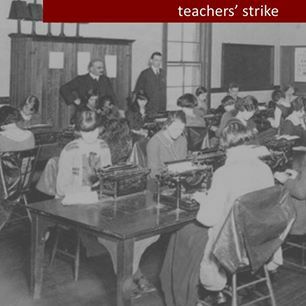 While female teachers represented most of the elementary school teachers in the district, they were underrepresented in the crucial strike negotiations of 1921. However a “Miss (Edna) Knight” does appear in the board minutes of December 21, 1920 as one of four teachers presenting the association’s demands in the lead up to the strike. 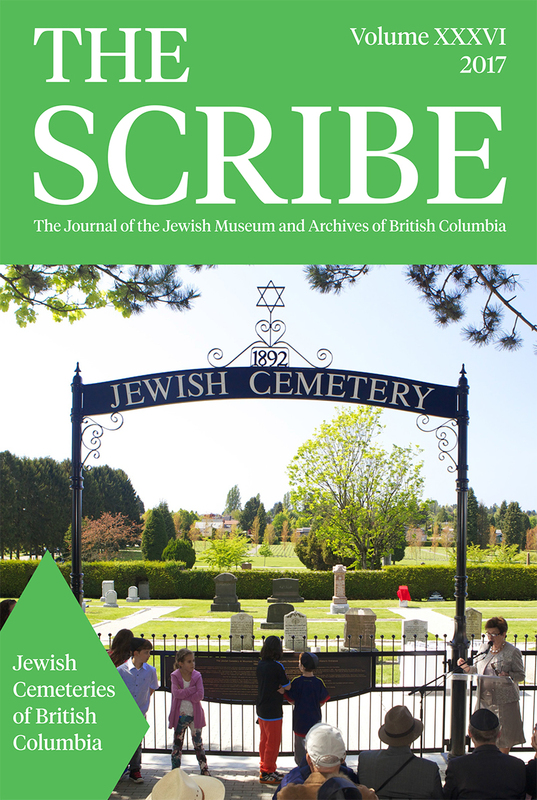 “Like a bolt from the blue, and to my profound astonishment, I was on Tuesday afternoon set upon by a number of special constables and arrested,” Israel Rubinowitz wrote from his prison cell in Nanaimo. It was autumn 1913 when the budding defence lawyer made a plea for his release, penning a letter to Judge Frederick Howay in the midst of a coal miners’ strike on Vancouver Island. Though a Conservative in politics, Rubinowitz offered a passionate, occasionally radical, perspective in British Columbian courtrooms. He grew up in Vancouver, studied at McGill University in Montreal and attended Oxford University in England on a Rhodes scholarship in 1905. He returned to Vancouver and had only practised law for a short time when he found himself in Nanaimo – as both counsel and accused. British Columbia’s public school teachers didn’t achieve the right to strike until 1987—but that didn’t stop them from walking off the job. In fact teachers across the province have engaged in several disputes since the BC Teacher’s Federation was established in 1917, all playing an essential role toward gaining full collective bargaining rights. Among these actions was the teachers’ strike in Terrace in 1981. It was the fourth— but not final—time BC teachers would participate in an “illegal” walk out. Tensions had been growing between the Terrace District Teachers’ Association (TDTA) and the nine-member school board in early 1981. About 337 teachers worked in schools enrolling 3,800 students within Terrace and other communities in northwestern BC. Local teacher associations (which included principals) only negotiated wages with their school boards and if they could not reach an agreement by a set deadline, the matter went to binding arbitration. School boards were not required to negotiate any working condition items with teachers. That fateful spring a popular middle school principal, Tom Hamakawa, was transferred and demoted to classroom teacher by the district superintendent Frank Hamilton. This disciplinary action was “the catalyst that brought the whole thing to the surface,” Wayne Wyatt, President of the TDTA, told the Vancouver Sun. “We want a decent policy established on how this sort of thing should be handled in the future.” The staff supported the principal “very strongly,” Wyatt also said. Three hundred students were sympathetic too, walking out of class and marching to the school board office in protest. You are currently browsing the Janet Nicol's Blog blog archives for October, 2017.